My purpose is to share an image of what likely preceded the arrival of the photographer at the end of the bridge. 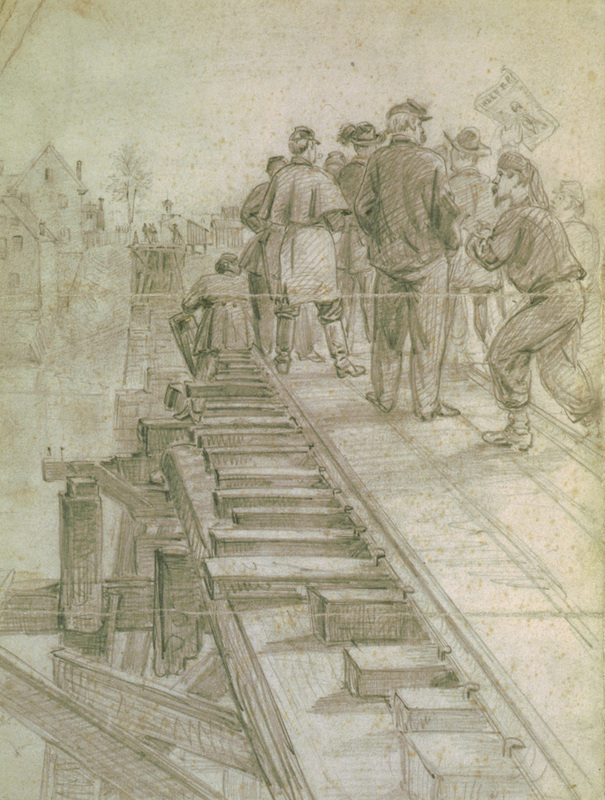 The great artist Alfred Waud was there, and he sketched this image, showing an excited gaggle of Yankee soldiers preening and peering at their enemies across the river. If not literally the scene behind the camera, it certainly illustrates the unseen side of the photograph, for surely behind the photographer that day were Yankees looking on. Not the most important revelation we have shared, but a different view of a familiar scene is always interesting. Last May, we did a two-part series on the Fredericksburg Fairgrounds (often called Mercer Square), which consumed much of what we now know as the Bloody Plain. Take a look at those posts here and here. Included in the second is a conjectural sketch done by Frank O’Reilly that included his best estimate, then, of the Fairgrounds. Here is the image as published back in May (click to enlarge). You will recall that this image was created as a reference for an original piece of art that is still in development. Since then, we have learned more about the Fairgrounds, most notably in the form of a sketch done by a visitor during the Confederate encampment there in 1861, published in the Library of Virginia’s magazine, Broadside. Here is that image (the original is at the Huntington Library). 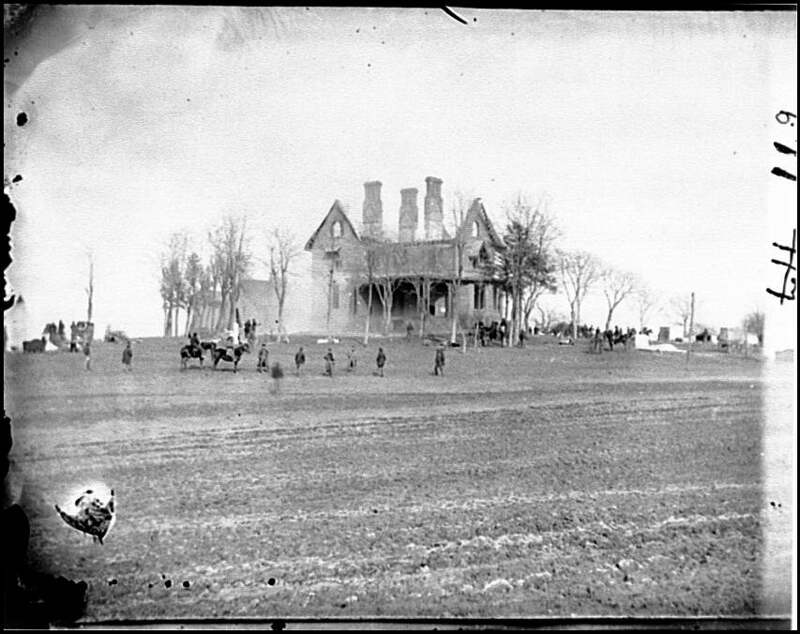 The Fairgrounds in April 1861, by a member of the 21st Virginia. The view looks south, from above the Stratton House. 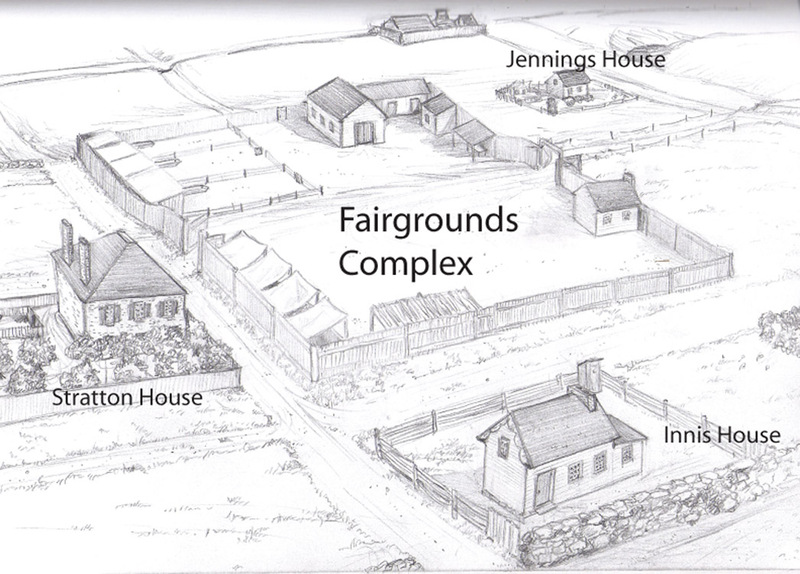 This by far is the best image we have of the Fairgrounds, and it has further refined our understanding of the Fairgrounds complex as it existed in 1861. Frank, a skilled sketch artist, has gone ahead and embodied all that we now know in a new sketch, which we share here. Looking southeast from above Brompton. Click to enlarge. Such is the progression of our learning and understanding, in this instance fortuitously embodied in art for all to see. 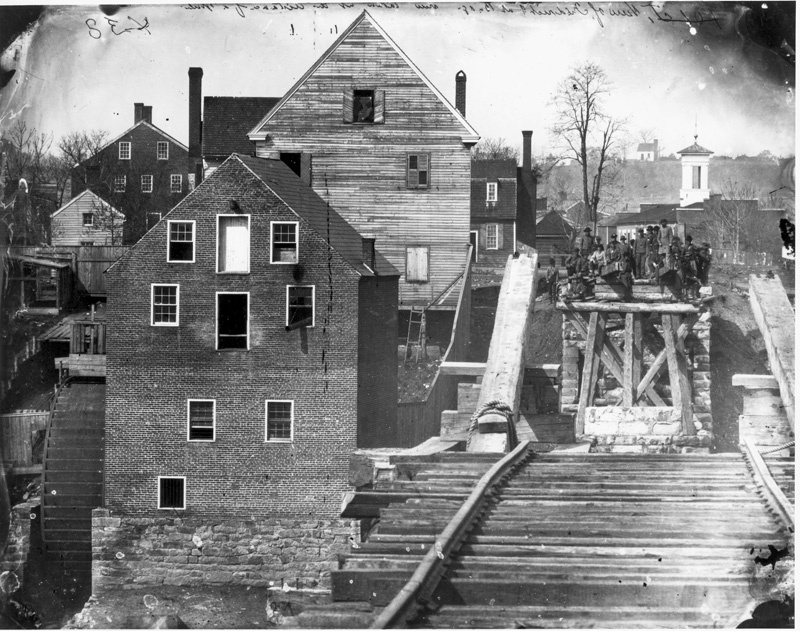 How soon after the summer of 1862 did Northern photographers resume documenting the Fredericksburg area’s wartime scenes? Considering this general question led me down an unexpected path to a particular part of a particular month in 1863, and to a certain area of Stafford County. The story I found was one of different artistic media that had converged to record and popularize an iconic tableau of freedom but, ironically, left its date and location unidentified. Yet it’s hard to imagine that the lapse in photo-documentation of outdoor scenes in the Fredericksburg area continued through an event as attention-grabbing as the December 1862 battle. After the summer of 1862, did the camera lenses really remain uncapped until mid-February 1863? Previously, I devoted a series of posts to another candidate for the distinction of earliest post-battle photograph of a local landscape: a stereograph depicting a flag-of-truce exchange, amid no less than 160 spectators, on the Fredericksburg riverfront. 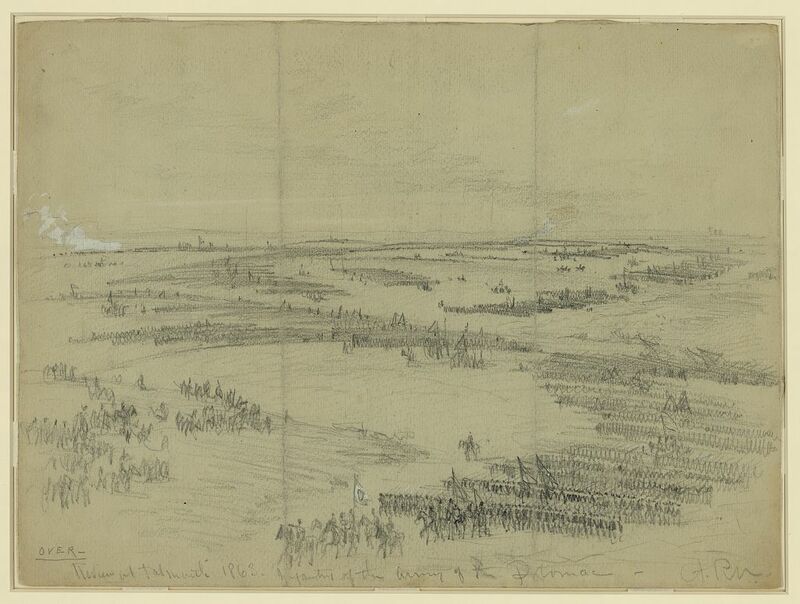 Although I would be delighted if this image turned out to document the post-battle truce crossings there on December 17-18, 1862, my current suspicion is that the actual date will prove to be sometime in February or March 1863, as suggested in different records at the Library of Congress, and when truce crossings indeed also occurred. 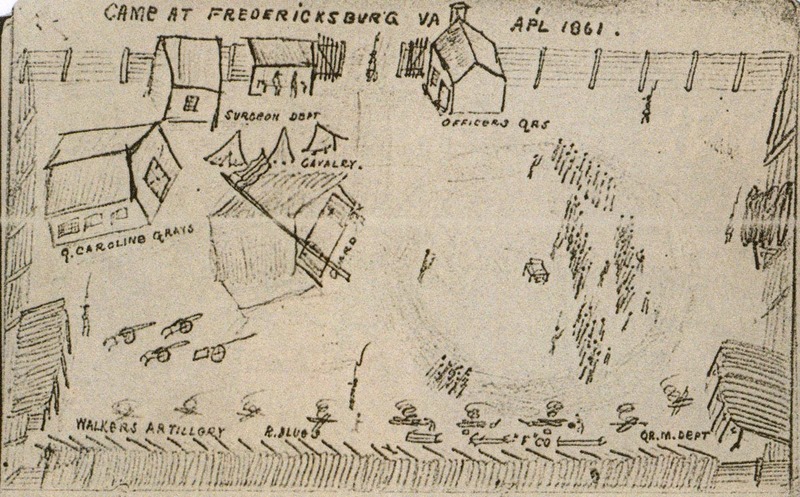 In an article published in the journal Fredericksburg History and Biography, I considered a third photograph as the area’s earliest outdoor-view following the December battle. Let’s revisit that image in order to update research, and to take advantage of the opportunities for higher-resolution analysis of pictures afforded by this blog. One of the more historic structures in Falmouth is the Conway House, located along King Street. Built in 1807, this Federal-style home is most well-known for having been the childhood residence of author, clergyman, and abolitionist Moncure Daniel Conway. On the eve of the Civil War, Moncure lived in Cincinnati, Ohio, where he served as a Unitarian minister, although his father and mother still lived in the Falmouth house. “When the Union Army under General McDowell entered Falmouth they found the village deserted by the whites. My father was in Fredericksburg, and my two brothers far away in the Confederate ranks. The house was left empty and locked up, the house servants remaining in their abode in the back yard. Yet as the Union soldiers were filing past a shot was fired from a window of the Conway House, or from a corner of the yard, and a soldier wounded. It was never known who fired the shot; our negroes assured me that the house was locked and watched. The Union soldiers, alarmed and enraged, battered down the doors, and, finding no one, began vengeance on the furniture. One of the gems recently uncovered in the pension files of the 23rd United States Colored Troops (USCT) pertains to a family that lived on a plantation known to many in the local area. 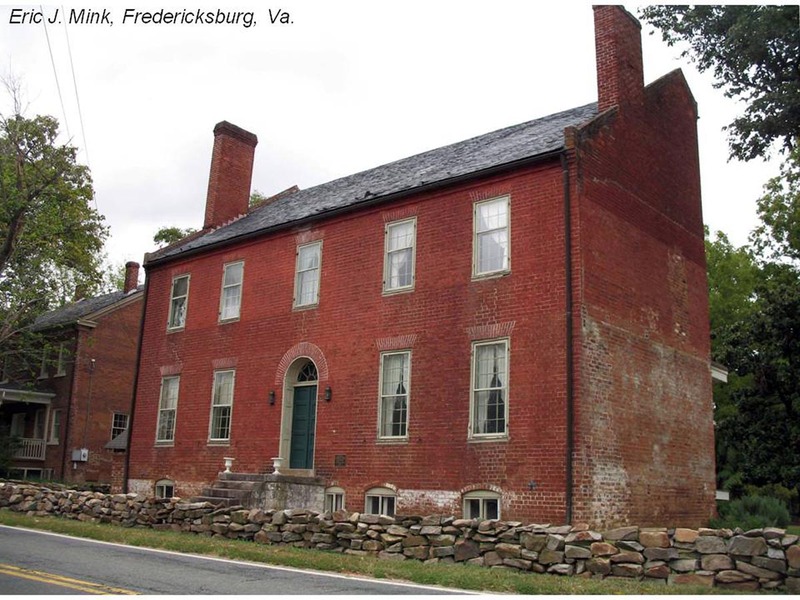 In the years prior to the Civil War, Hester and Abraham Tuckson were slaves owned by Dr. John R. Taylor of “Fall Hill,” located in Spotsylvania County along the bend of the Rappahannock River northwest of Fredericksburg. Abraham was one of many slaves from the Fredericksburg region who escaped to freedom during the war and enlisted in the Union Army. He was killed on July 30, 1864 at the Battle of the Crater outside Petersburg, Va. Hester remained at Fall Hill through the end of the war and began drawing a widow’s pension in 1873. Due to confusion over her first name, Hester’s claim was reexamined in 1902. At that time, depositions were provided by Hester, Dr. Taylor’s son, Robert Innes Taylor, Dr. Taylor’s brother-in-law, Frank Forbes, and Reverend George L. Dixon. The following information, gleaned from these depositions, provides both insights and clues for further investigation into the lives of these two former Spotsylvania slaves. According to Hester, she and Abraham Tuckson were married at Fall Hill in December 1857. More than likely the marriage occurred around Christmas. The union was a slave marriage, which lacked any legal standing or protection, but the couple managed to remain together and raise a family before Abraham’s departure during the war. Hester and Abraham had four children together: a daughter Emma born May 1856 and prior to their marriage, another daughter Nancy born September 1858, and a third child who died. Their fourth child, Leonia was born in August 1862. Early in the war, Abraham escaped from Fall Hill, leaving behind his wife and children. Exactly when he left the plantation is a little uncertain, as Hester’s claim does not correspond with that of either R. Innes Taylor or Frank Forbes. In her deposition, Hester states that Abraham ran away in 1862, while engaged in hauling commissary stores for the Confederate authorities. 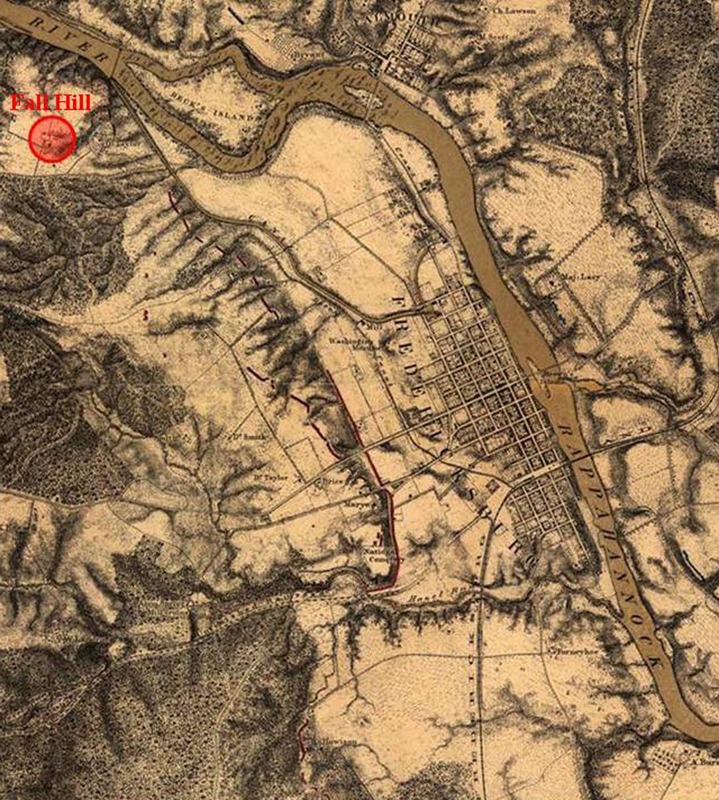 Documents in the files of Confederate Citizens and Business Firms, located at the National Archives, do show that during the period August 1861 through March 1862 Dr. Taylor hired out wagons and drivers to the Confederate Army encamped across the river in Stafford County. So, it is possible that Abraham made his way into Union lines at that time, although it would certainly have been difficult to pass through the Confederate held territory of northern Virginia. Dr. Taylor claimed compensation for losses of a mule and damage to wagons, but did not mention the loss of a driver. 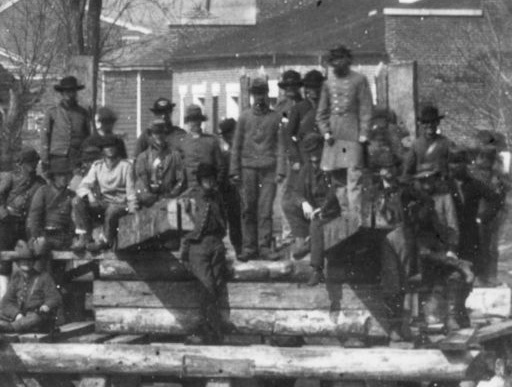 Innes Taylor and Frank Forbes, on the other hand, claim that Abraham made his escape when the Union army arrived opposite Fredericksburg in the spring of 1862. This seems much more likely as the time for Abrham’s departure. 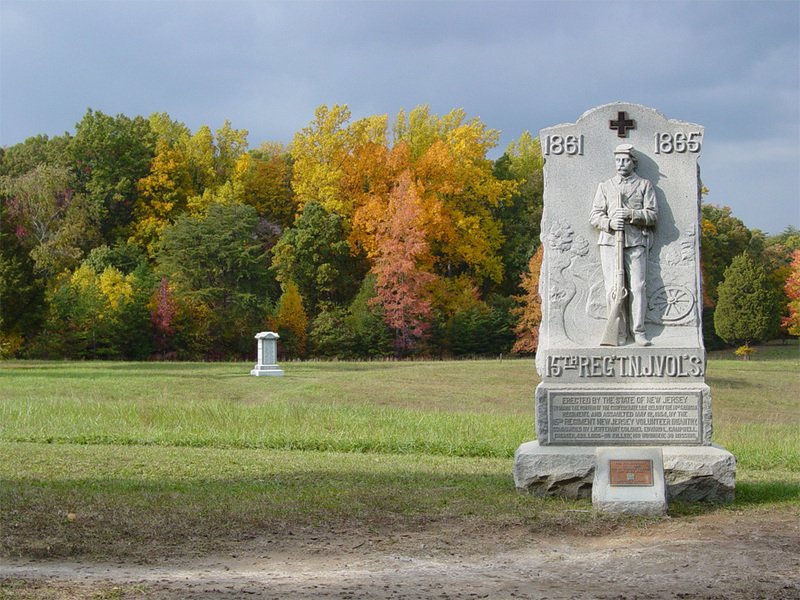 The 15th New Jersey Monument at the Bloody Angle, with the informal path in front of it--a mudhole on many days. The business of creating a park takes generations. At Fredericksburg and Spotsylvania, hundreds of acres included in the boundary expansion of 1989 remain unaquired. When money is tight (as it is now) we might be able to manage the acquisition of a parcel or two a year, and we are more reliant on privates-sector entities like the Central Virginia Battlefields Trust and Civil War Trust. Even when money is available to us (as it was in the late 1990s and early 2000s), the park can only acquire what people are willing to sell. Often, the going is slow. There will be plenty still to do long after I and the rest of the current staff are on to other lives. 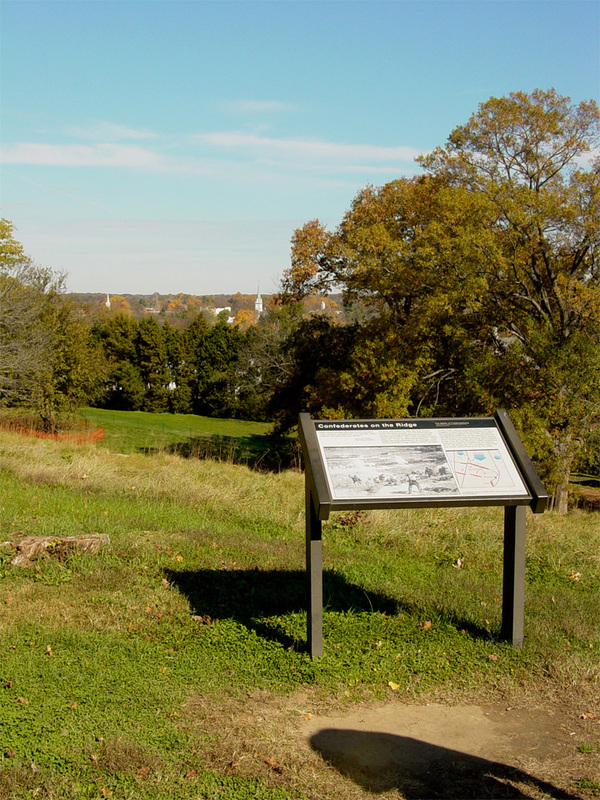 One of the new exhibits on Marye's Heights installed "naturally." Note the ugly, worn area in front of the exhibit. The park is also continually evolving in terms of media and public facilities. Back in the day, cast aluminum signs were the best that could be done, and so the park had dozens of them, beautifully written by former staff historian Ralph Happel (who, by the way, laid the historiographical foundation for the modern park with his work over 36 years here, ending in 1972). Over the last nine years, we have been transitioning to smaller, low-profile exhibits–less intrusive, more graphic-rich. (We are leaving a few of Ralph’s signs in the park–those that are accessible only by car, like those along Jackson Trail.) In fact, we are now in the final phase of wayside exhibits parkwide. 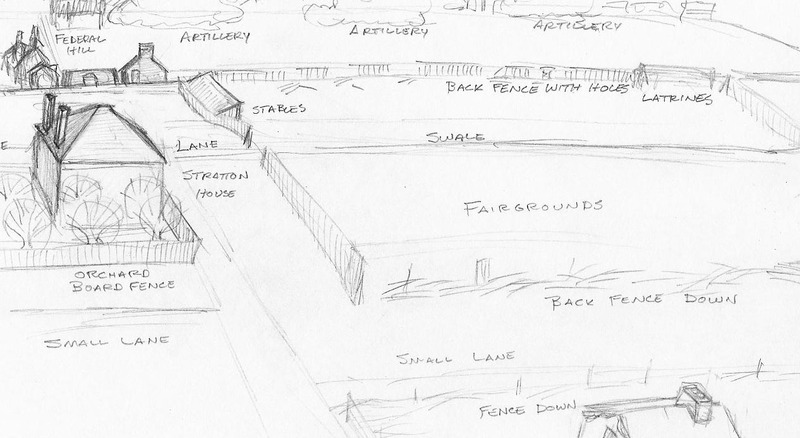 We hope to have the final package of new exhibits in at Spotsylvania this spring. The scope of Waud’s extraordinary picture, and its identification of the reviewed troops as the “Infantry of the Army of the Potomac” generally, suggest that his subject was the largest of the reviews, held on April 8 under the gaze of President Abraham Lincoln. Lincoln may be astride the horse slightly advanced from all the others on the rise at lower left.